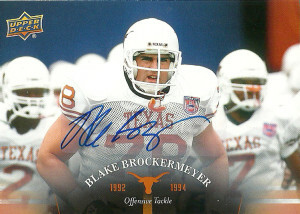 Blake Brockermeyer played tackle for the University of Texas from 1992-1994, earning All-American honors in 1995. He’d be taken by the Carolina Panthers with their second first round choice of the ’95 draft at 29th overall. Blake was a 4 year starter at left tackle for Carolina, before jumping over to the Chicago Bears in 1999. He played for the Bears from 1999-2001, but unknowingly blew out his shoulder badly that season in a game against Detroit. After not getting correct advice from team doctors, he continued to play on the bad shoulder- ultimately shortening his career. Blake joined the Broncos in 2002, where he played through 2003 as a solid reserve player, starting 3 games. After football Brockermeyer has become a certified Performance Coach, and a Strength and Conditioning Specialist at the High School level. He has his own website as well where he promotes Brockermeyer Core Performance.